In this special series we look into a food stuff that many of us take for granted and buy from a supermarket without much thought. We're talking about rice. Rice Bowl Tales is a series of four programmes exploring the importance of rice to Asian economies, and how the crop contributes to a sense of national identity. The series is a co-production between BBC World Service and ABC Radio National in Australia. 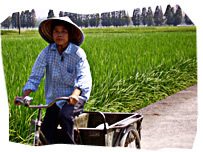 In the first programme of the series our presenter Tony Barrell, is in China, the world's largest rice producer. Tony talks to farmers, scientists and rice enthisiasts about what rice means to them. We also meet a government guide who has never seen a rice field. As the research scientists explain, China's new priorities are clear: more rice from less land, using less water and fewer chemicals. A visit to the shopping malls of in the world's newest futuristic metropolis Shanghai. The foremost exporter of rice world wide and has a growing market in Africa. The green revolution of the 60s led to growth of rice production in Bangladesh. In the Land of the Rising Sun rice is at the centre of the struggle about national identity.